Cruise speed is about 155m/s with all ten engines going, ~160m/s with WEP activated but then fuel consumption goes through the roof. 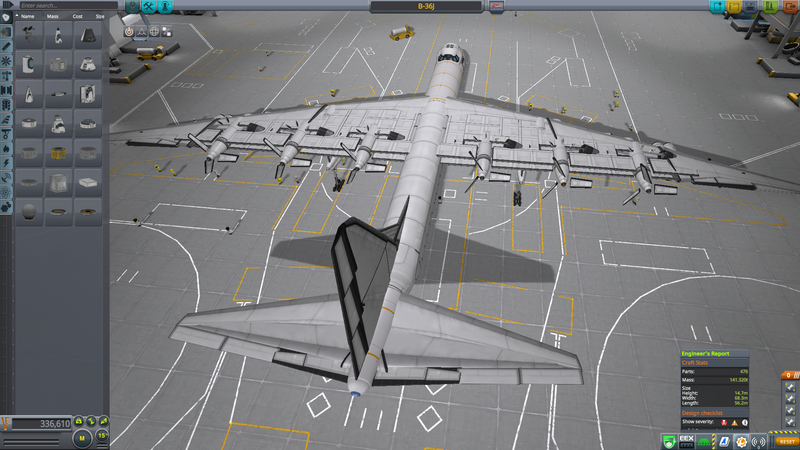 It can fly on the prop engines alone but only about 90m/s. Make use of the flaps and thrust reversers when landing because the brakes alone do little to slow this thing down. Control defaults to the rearward facing cockpit so you need to set the front one as the control point. Do not exceed 180m/s or the engines will go over 46rad/s and engine damage will result.
! ! ! BROKEN IN 1.4 ! ! ! A stock aircraft called B-36J. Built with 476 of the finest parts, its root part is Size3SmallTank.